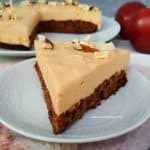 Delicious, moist Apple and Carrot Cake, topped with silky smooth Caramel Cheesecake Apple Carrot Caramel Cheesecake is a “best of two worlds” dessert ! 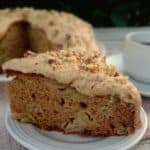 The base is a moist Apple Carrot Cake, with a silky smooth Caramel Cheesecake layer on top. 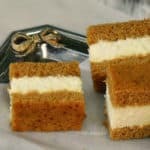 Ginger Cake with Creamy Lime Filling is a moist, lightly sticky cake with a zesty Lime cream cheese filling – prefect for dessert or as part of a sweet party platter. Ginger Cake with Creamy Lime Filling is the perfect dessert to take with to a family gathering, or when you host a party yourself…. 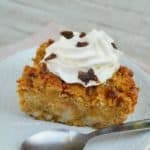 Chewy Pumpkin bars with spices and cinnamon baking chips make this an extremely delicious Fall dessert – so easy, mix and bake ! 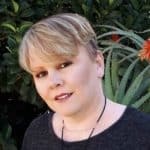 I am sure I have mentioned before that we do not have canned Pumpkin puree in South-Africa, or in any case not at any of the usual big supermarkets I shop at…. 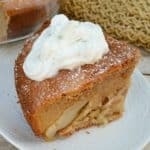 Apple cake with Maple Cream Cheese Frosting is an easy, no-fuss single layer cake and always a winner at tea time or to serve for dessert I make this Apple Cake with Maple Cream Cheese Frosting quite often as it was a hit with my family since the first bite. 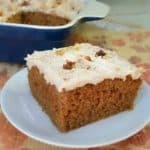 Pumpkin Cake Bars are moist, soft and delicious to serve especially as a Fall dessert, tea time treats or anytime snacking These easy to make, Pumpkin cake bars are one of my favorite recipes. 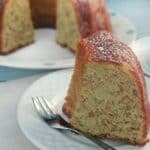 Not only because it is a quick and easy recipe, but most delicious as well. 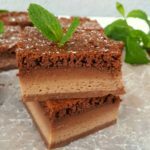 Chocolate Eclair Cake is an easy spin on the popular cream filled Eclairs – so divine and made at home with everyday pantry ingredients ! 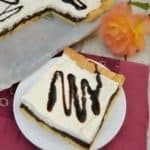 Chocolate Eclair Cake is a delicious variation to the ever popular Eclairs. Only much quicker and easier to make with everyday ingredients. 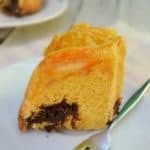 Chocolate Orange Marble Cake is easy to make and so special with the candied, baked-in fresh Orange slices – an all time winner year round Chocolate and Orange Marble Cake is a delicious, quick and easy sweet treat which you can have ready within an hour to serve as dessert or at tea time.